The effect of changed polarization on a direction finder occurring at night. The effective range of a long-range beacon that has a daytime range of 200 NM may be reduced to about 70 NM by night. This reduction in range occurs because of the presence of sky wave propagation in an LF/MF (low- and medium-frequency) band. 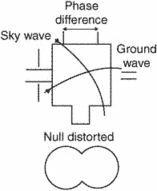 The sky wave is not present during the daytime, but at night the sky waves affect the ADF (automatic direction finder) accuracy. The change in polarization in radio waves refracted by ionospheric layers results in a signal voltage being induced in the horizontal positions of the loop antenna, causing erroneous bearing directions. The effect is most common at night. The malls were judged for the day and night effects of their Christmas decorations as well as the use of interactive features to create an engaging experience for shoppers. As such, day and night effects can be simulated very subtly. The company's whitening category also had two new entries on display: Crest Whitestrips Premium Plus, which P&G claims provides Crest's highest level of whitening, and Crest Night Effects Premium whitening product, which was developed specifically for consumers with sensitive teeth. The graphics help with the realism of the game, with realistic day and night effects, weather conditions and spectacular special effects adding to the ambience of the gameplay. And that's not including Crest's White Strips, its dental whiteness formula, or Night Effects, its nighttime whitening system. 4% Drug stores Crest Night Effects Procter & Gamble 3. The other new product is Crest Night Effects Premium for Sensitive Teeth, a paint-on tooth whitening gel. 4 COLGATE SIMPLY WHITE 87,496,456 NA CREST NIGHT EFFECTS 22,676,062 NA COLGATE SIMPLY WHITE NIGHT 21,503,012 NA REMBRANDT DAZZLING WHITE 7,732,538 -32. Bryan McCleary, associate director of external relations, global oral care, for Procter & Gamble, has witnessed this happening across every one of the whitening products under the Crest brand, from its Whitening Expressions toothpaste to Crest Night Effects to Crest Whitestrips. Cincinatti-bosed Procter & Gamble is introducing Crest Night Effects, a nighttime whitening system that is designed to work over 14 nights to deliver what company officials soy to a superior whitening result vs.